So there we are, my partner and I, and we’re slogging up Whitsunday Peak on Whitsunday Island, and it’s hot and humid. My sandfly bites are driving me crazy, and mozzies the size of elephants are trying to carry me away. I’m wondering if my desire not to be the first one to say ‘let’s stop’, will beat my desire to get back to Dugong Beach as quickly as possible and plunge myself into the beautiful, clear, turquoise water. So we turn around and pick our way back down through the rainforest, and into the scrub, and back along the path to the beach, and as we do, I’m thinking about my (then) 13-year-old daughter Anna, and how much she loves to do dance. I’m swatting away the mozzies, and wiping the sweat from my brow, and I suddenly get this little dancing image in my mind. At least, it’s a little girl, but she’s not exactly dancing, she’s doing Ninja moves. “Yee-hah!” she’s shouting, as she puts up a hand to stop an imaginary opponent, and I’m surprised though, that she’s dressed in a little pink tutu and ballet slippers – because even though I’ve only just made her acquaintance I’m absolutely sure she doesn’t want to be a ballerina, she wants to be a Ninja. The Ninja Ballerina I think to myself, and suddenly a name pops into my head. Belinda. I’m almost jumping up and down on the spot – I’d be doing Ninja moves at the brush turkeys if I was supple enough. There’s a wonderful moment as a writer, when an idea comes to you – and just for a moment you see it there, already written, already published even, and it’s perfect, it’s just as you imagined it, it’s a success, everybody loves it…and then, reality hits. To begin with, you actually have to get the words out of your head on to paper, or computer, and then you have to begin the arduous process of working on the words, and even worse, fight off the internal nay-sayers who are only too happy to tell you that your idea is no good, and why on earth do you think you can write a book. Those voices don’t even listen when you tell them you’ve written books before – “yeah, well,” they’ll say in derision, “just because you’ve done it before doesn’t mean you can do it again.” When I teach creative writing I always tell people – when you write something, at some point or other you’re going to have to cross Mordor. But as I sat on a wooden bench, under a palm tree, trying to get this cheeky curly-headed girl out of my head and into a story, the words flowed as swiftly as a river, and within an hour, she was written. There was only one problem – I wished desperately that I could draw – I so wanted Belinda to look as I imagined her, and not how someone else might imagine her. But I needn’t have worried, because for whatever magical reason it might be, Belinda’s birth into the world of books, has been as easy and blessed as the moment of creation. 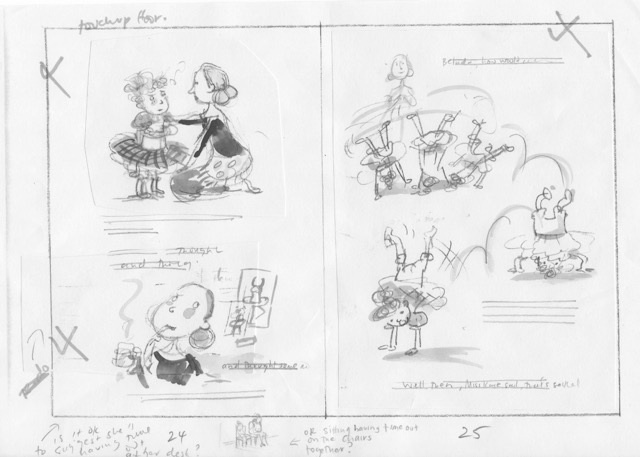 Mitch Vane’s first rough drawings for Belinda the Ninja Ballerina. Some people have already asked me the obvious question of whether I did ballet as a child, and I did – but let’s just say that I was not the most graceful child on the block. In fact I was pretty much permanently traumatized from the age of four when my father came to see me dance at my end of year kindergarten concert. We were doing a Little Miss Muffet sequence, and I was very proud of my pink tutu, tights and ballet shoes. I ran up to my parents after it was over, and my father looked at me solemnly. “Well,” he said, “Stay as clumsy as that and you’ll never make a dancer.” I sat down on my little pink bottom and burst into tears while my mother hugged me and not for the first or last time looked at my father reproachfully. And there I was sitting under a palm tree on the other side of the world over 50 years later, and the idea of the Little Miss Muffet sequence came flooding back in – but this time, Belinda took control. No cute little costumes for her – no way, she wanted to be the Ninja spider. Graceful be damned – she was going to dance her way, or no way. When Paul Collins, the publisher of Ford Street books in Melbourne, accepted Belinda I was delighted. I love what he does with children’s books – the care he takes, the fact that he’s stuck to his guns and still prints picture books in hardback, and when he mentioned to me that perhaps we should approach Mitch Vane to do the illustrations, I was over the moon. I know Mitch’s work well, although I’ve never met her, and sitting far away in Byron Bay, waiting for the first drawings to come in, I felt a combination of excitement and trepidation. How would Mitch see Belinda? After all, they’re not called ‘picture’ books for nothing – the words may have come first, but the pictures were essential. Would Mitch’s vision match mine, or would she see Belinda completely differently? When the email arrived with the first roughs, I almost broke the keyboard in my excitement to open them – and WOW – there was Belinda. My Belinda. A cheeky curly-haired red-head, with a grin, and a Ninja costume, cart-wheeling her way through the pages of the book. It’s interesting when you write a book, or a story, or essay, how other people see it – sometimes as a writer you may question their interpretation, sometimes they see something you didn’t even see when you were writing. Mitch spotted an element to the book that was entirely unconscious in the writing, and that was Belinda’s constant movement. It seemed that Mitch and Paul both connected with Belinda’s determined personality, and then throughout the publishing process there was also Dmetri Kakmi – Belinda’s editor – the contact point between us all – publisher, author and illustrator. He too loved Belinda, and carefully negotiated the minefield of dealing with ‘creatives’ to gather the various strands into the whole that has become the book that at this moment – after 14 books – has most perfectly realized that moment of creation. 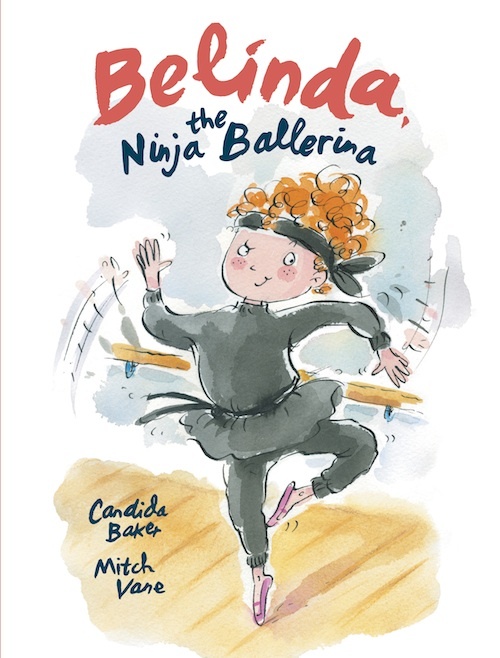 I know how lucky I am as a writer to have had this experience, and as Belinda the Ninja Ballerina is launched into the world next week, I hope many young readers enjoy her message on the importance of standing up for yourself.